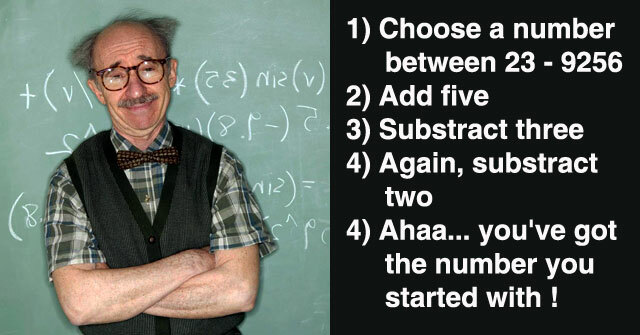 One of the fun things about math jokes is that it gives teachers/parents the chance to talk about a math topic! If they don’t get the joke about pi, then you can explain pi. If they have no idea what a geometry is, then you can show them.Math jokes are also a great way for teachers to lighten up the mood in the classroom, especially if students are getting bored. Have fun laughing at our funny math jokes for kids. Enjoy a range of great jokes related to everything from numbers to statistics, fractions, mathematicians and algebra. Q: When the Great White shark showed up, where was the octopus? Q: If you cut up a general into 1,000 pieces, what is one of the pieces called? Q: Where did the mathematician's family eat dinner every night? A: At the multiplication table! Q: Why were 10 and 11 mad after the race? A: I like your belt! Q: What did the pirate say to 5 × 16? Q: What do da glasses help with? Q: What do you call an angle after it gets in a car crash? Baker: No! Pie are round, cakes are square! Q: What do you call a seagull who won't give up on her geometry homework? Q: What do you have when you give a shot of anesthetic to a line? Q: What kind of snake likes to do math? Q:Why was the right angle sweating? A: It was 90 degrees! A mom said to her toddler, "I'm counting to three! One, three!" The toddler said, "Why did you skip two?" Mom said: "Because I can't even right now!" Did you know that all numbers are interesting? What’s that? You don’t believe me? Well I have a proof. Suppose not every number is interesting. Then let n be the smallest uninteresting number. That’s a rather interesting property isn’t it? A: The mathematician only needs paper, pencil, and a trash bin for his work - the philosopher can do without the trash bin..
We have been married for nearly thirty years, and I still love you as much as on the day I proposed. You must realize, however, that you are now 54 years old and no longer able to satisfy certain needs I still have. I very much hope that you are not hurt to learn that, while you're reading this, I'm in a hotel room with an 18-year-old freshman girl from my calculus class. I'll be home before midnight. Your husband, who will never stop loving you. You may recall that you, too, are 54 years old and no longer able to satisfy certain needs I still have. I thus hope that you are not hurt to learn that, while you're reading this, I am in a hotel room with the 18-year-old pool boy. P.S. As a mathematician, you are certainly aware of the fact that 18 goes into 54 many more times than 54 goes into 18. Therefore, don't stay up and wait for me. A student walked into his discrete math class late and in order not to interrupt he put his late slip on the teacher's desk furtively without the teacher noticing. The teacher noticed the slip on his desk afterwards. He commented "I see you put this slip on my desk without me noticing. I guess that's why they call this class discrete mathematics." There is a shipwreck, and the only three survivors are a Doctor, a Lawyer, and a Mathematician, in a rowboat. After some time drifting about the seas, eventually they get get to talking and get to know each other. One day the doctor asks, "Is it better to have a wife or a girlfriend? I would say it's better to have a wife. I work long hard and emotional hours, and it's really great to have a caring wife who cooks great meals, cleans my clothes, and expertly manages our home and children." The lawyer says, "I think it's better to have a girlfriend. I'm a Divorce Lawyer and the cost to the man in Divorce is so extreme I don't see where having a wife is worth the risk." The mathematician says, "I think it's better to have both." "What !?" say the doctor and lawyer. "Why?" "Because," the mathematician says, "You can tell your wife you're working late, and your girlfriend you need to spend time with your family, which gives you more time to work on proving the Riemann Hypothesis !" That is funny math jokes for kids.